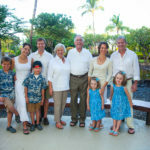 Steve and Lisa had a wedding blessing ceremony on the beach at the Mauna Lani Beach Resort on the Big Island of Hawaii. They are going to have a larger wedding back on the mainland, but wanted something intimate just for themselves. Their day was filled with beautiful wedding, a great sunset, sailboat, tiki torches and a Green Sea Turtle. 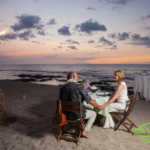 Happy to have been their Kona wedding photographer.